We have chosen to highlight corrosion investigation and initial condition assessment of structures. Our first article talks about the expanded use of concrete resistivity for lifecycle estimation and how it is being used to replace the Rapid Chloride Penetration test and our second article introduces some of what our visiting expert from Force Technologies in Denmark Mr. Oscar Klinghoffer had to say about corrosion investigation and monitoring.. The Rapid Chloride Permeability (RCP) test was originally introduced in the 1990’s as a means of assessing reinforcement corrosion protection provided by concrete. Originally it was thought to combine a measure of chloride diffusion and resistance to current flow and hence give a result that could be used to assess corrosion protection afforded through the initiation and propagation phases. In Australia chloride diffusion tests were already being used to assess concrete performance, but the tests took a long time and had by then been proven to only give information on the initiation phase. Also there were no simple criteria. Later there were criticisms of the RCP on the basis that it was primarily a measure of resistivity and that some additives could give results indicating poor corrosion resistance whereas the additive increased corrosion resistance, e.g. calcium nitrate. 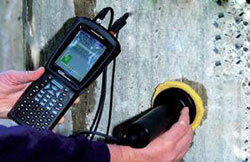 However the RCP has remained a popular quick QA tool for assessing concrete corrosion resistance. As a QA tool the RCP test criteria can be set for the specific concrete mix at the time of the mix trials. 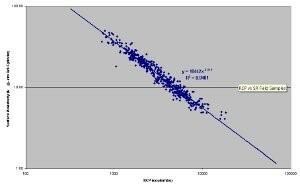 A study initiated in 2002 by the Florida Department of transport has determined a strong correlation between Rapid Chloride Penetration [RCP] measurements and saturated resistivity measurements taken on the same samples (see image Right). This discovery means testing can now be done in 10 minutes instead of 10 days using the same cylinders or cores used to determine compressive strength. To solidify this ASSHTO have drafted the Surface Resistivity Test specification to standardise the test. Replacement or augmentation of the RCP test with Surface Resistivity tests of saturated samples has the added benefit of lower costs and greater volume of tests. It is easy to visualise the concrete lab removing the test cylinder from the water bath, placing the Resistivity meter on the cylinder and then placing it in the compression testing machine for crushing. PCTE are proud to represent Proceq and their concrete NDT products. 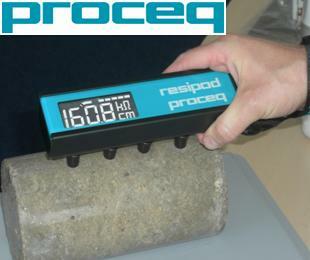 Proceq have introduced the ResiPod for Resistivity measurements. It is a one piece device which is rugged and water proof. Proceq recognised a significant limitation of resistivity measurements was calibration and probe contact. The Resipod has been designed to overcome both issues, special probe design and current compensation makes it a market leading device. PCTE were excited by a visit from Oskar Klinghoffer of Force Technology to Australia in October. He presented a paper on Durability Design for the Concrete Institute of Australia’s conference. Force includes ‘Corrosion Centralen’, a Danish company famous in the 70’s and 80’s for its pioneering research and application of corrosion testing. Force continues to be a world leading consultant in this area but is also famous for the testing equipment they have developed such as the Galvapulse and its successor the Corromap, a range of embedded corrosion monitors <<CorroWatch, CorroRisk>>, and ERE 20 MnO2 reference electrodes. Oskar is the leader of their concrete department and is a sought after speaker on corrosion assessment and monitoring. PCTE were fortunate to get Oskar to come to Australia and after the Concrete 2011 conference he met with companies around Australia on a mini-Roadshow.